Ospreys withstood a late Dragons comeback at the Liberty Stadium to secure a fifth successive Pro12 win. Dan Evans and Hanno Dirksen scored first-half tries as the home side enjoyed almost total control. There were few fireworks in a match that lacked the usual intensity of a Welsh derby, and it was nowhere near the standard of Ospreys' Boxing Day win over Scarlets. But the victory continued the home side's recent improvement, although it came at a cost with them losing Dan Lydiate, Aaron Jarvis and replacement Dmitri Arhip to injury. Having thrown away their lead against Cardiff Blues earlier in the week, it was another disappointing result for the Dragons as they settled for a losing bonus point once more. Ospreys decided they could do without playmaker Dan Biggar, giving understudy Davies a rare opportunity to start. He made an inauspicious start, though, missing two kickable penalties at goal inside the first 12 minutes. It failed to dent his confidence as he began to look dangerous with ball in hand, and a deftly delayed pass freed Evans for the opening try midway through the first half. The home side's monopoly of possession continued, with flanker Lydiate and Justin Tipuric in dominant mood. But they had to wait until five minutes before the break for the second score when Dirksen dived over as the Dragons ran out of defenders trying to repel a slick sequence of drives deep in their own half. Having also missed the earlier conversion attempt, Davies finally succeeded to split the posts to ironic cheers from the home crowd. The Dragons managed to stay in touch after the break despite more Ospreys pressure, and Jackson's try, converted by Jason Tovey, from a textbook driving line-out turned the game into a meaningful contest for the final 15 minutes. Ospreys immediately brought on Biggar for Davies, and his first task was to win the race to a kick ahead to deny the Dragons another try. 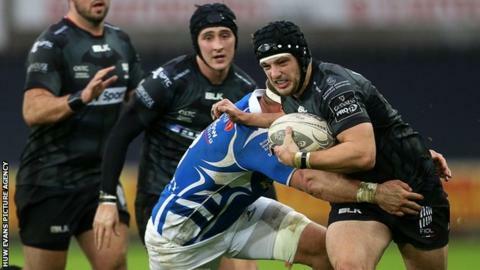 The visitors suddenly decided it was time to play some attacking rugby, but Ospreys had enough nous to run down the clock to secure an eighth successive win over the visitors. Ospreys backs coach Gruff Rees told BBC Radio Wales: "We're pretty disappointed really. "We were on the back foot and gave away a couple of penalties and they had the momentum. We were clinging on." Dragons director of rugby Lyn Jones told BBC Radio Wales: "We need to score some points in the first 20 minutes. "Our kicking game wasn't what we wanted it to be, and we weren't able to sustain any pressure to create points. "We defended well but after a while it was too soft - too many missed tackles. "We put in a better performance in tactically in the second half and we showed a lot of character." Ospreys: Dan Evans; Jeff Hassler, Ben John, Josh Matavesi, Hanno Dirksen; Sam Davies, Tom Habberfield; Nicky Smith, Scott Baldwin, Aaron Jarvis, Lloyd Ashley, Alun Wyn Jones (capt), Dan Lydiate, Justin Tipuric, Dan Baker. Replacements: Sam Parry, Ryan Bevington, Dmitri Arhip, Rory Thornton, James King, Martin Roberts, Dan Biggar, Jonathan Spratt. Newport Gwent Dragons: Carl Meyer; Nick Scott, Adam Warren, Ross Wardle Ashton Hewitt; Dorian Jones, Sarel Pretorius; Boris Stankovich, Thomas Rhys Thomas (capt), Lloyd Fairbrother, Matthew Screech, Rynard Landman, Nick Crosswell, Ollie Griffiths, Ed Jackson. Replacements: Elliot Dee, Phil Price, Brok Harris, Cory Hill, Nic Cudd, Charlie Davies, Jason Tovey, Aaron Warren.